Sarah Janece Garcia's splashy turtle print serves a reminder to ride the waves of change. Inspired by the legend of Akupara—a sea turtle believed to carry the weight of the world on its back with ease—this painting by Sarah Janece Garcia captures the tale through beautiful brushwork and splashes of color. Featuring a turtle floating along without a worry, the artwork reminds us not to fret over our journey through life, but to float with the waves and embrace whatever lies ahead. Made in Dallas, Texas. Printed and framed in Portland, Oregon. 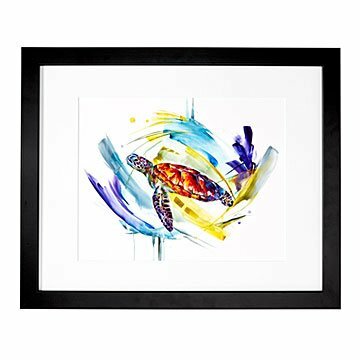 This reminded me of different trips I took where I saw sea turtles and I love all the colors. This is my 4th Sarah Janece Garcia! All are stunning and are definite conversation starters. I admire her works, all of them! This is for my son-in-law's September birthday. He will be so thrilled!